Heat gas or charcoal grill. Meanwhile, in medium bowl, mix Bisquick mix, 1/2 cup of the sugar and the milk; beat 30 seconds. In 9-inch round foil cake pan, melt butter on grill over medium heat. Pour batter over butter in pan. 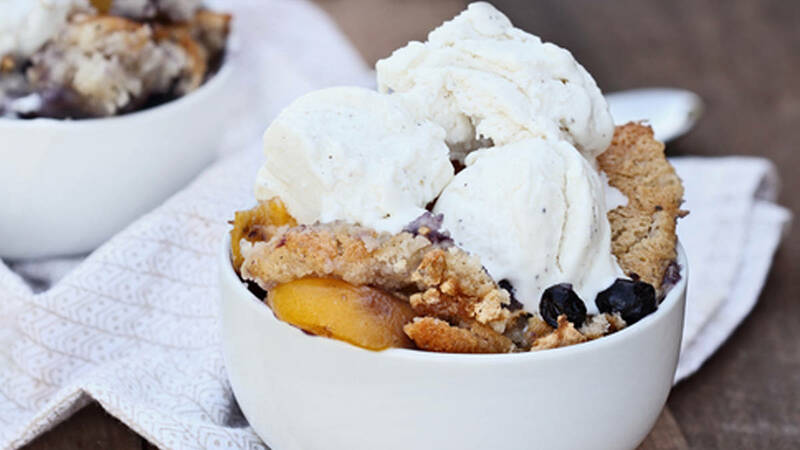 Top with nectarine and blueberries. Sprinkle with remaining 1/4 cup sugar and the cinnamon. Cover grill; cook about 30 minutes or until toothpick inserted in centre comes out clean. Substitution: Blackberries can be substituted for the blueberries and a peach can be used for the nectarine. Success: After the cobbler is baked, move the pan to the side of the grill to keep it warm.